Here at William Edwards Home we love a night out, but on Valentine's Day a night (or day) in can be so much more romantic. Here are our 5 tips on creating the perfect Valentine's Day table setting for your one true love. 1. We love flowers more than the next person, but they don't always have to be used as centrepieces. Attaching fresh blooms onto the back of your loved ones chair, is a unique twist on the average table arrangement. 2. Valentine’s Day isn’t just for dinner. 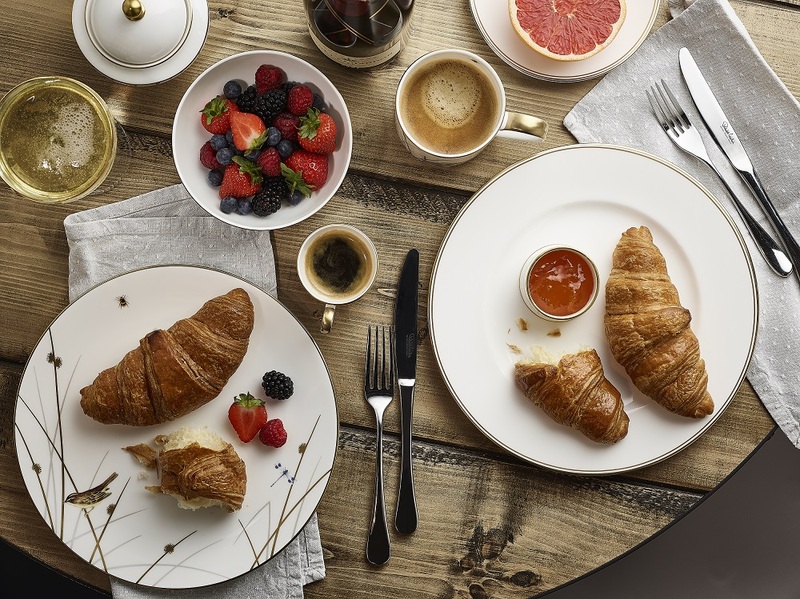 Surprise your other half with a decadent breakfast with all the trimmings including croissants, fresh berries and Champagne – served picture perfectly on white fine bone china. 3. Fresh flowers in shades of pinks, reds and greens are a Valentine’s Day go-to for a reason - they scream romance. Pop the flowers in small vases and scatter around the centre of the table, remember to keep the flower arrangements low so you can see your loved one across the table. Repeat the pink hues of your floral arrangements in the food or pink Champagne for some extra pop of colour. 4. Using shades of amethyst, silver and gold will give your table setting a whimsical twist. Add a table runner with pops of bold colour, Moroccan lanterns and white bone china for a romantic dinner that won’t soon be forgotten. 5. For a stylish contemporary look, serve your food on William Edwards Home Spiro white bone china which has a raised white geometric decoration. Ensure your cutlery is highly polished and bathe the table in candle light and enjoy a romantic evening!